To underline their partnership ActionSportGames and ICS Airsoft have revealed the HERA Arms CQR at SHOT Show 2018. The HERA Arms CQR is a joint partnership project by ActionSportGames and ICS Airsoft. The Airsoft rifle is designed and developed using original blueprints and drawings provided by HERA Arms, and will also feature components custom made for Airsoft by HERA Arms. The project is built on the ICS CXP AEG platform for proven reliability and performance. Upon release, the HERA Arms CQR will be available in black, tan, and OD green variants. 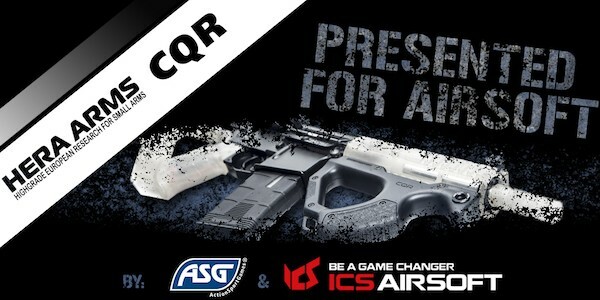 To check all details on the CQR, check this ASG landing page. Further another Airsoft accessory has been launched together with the Real steel German firearms manufacture HERA Arms, the new Multi-Position Polymer Front Grips! Hera Arms has developed a new innovating front grip for most MIL-STD 1913 Picatinny Rails. ActionSportGames (ASG) is proud to announce the release of the Airsoft Version to the world. And this is a really good looking option if you ask me! Not to forget the new Storm 360 grenades in several new colours! Speaking of colours, did your see those fancy looking Urban Grey P-09 & Shadow? And we hope to see a production ready model of their announced Licensed Arsenal AR-M7T (coming soon) at IWA 2018!